 This is a fascinating and disappointing story. It is remarkable that the brilliant MGM Tarzan series lost its impetus with only the third film, considering the high quality, and enormous box office returns, of the first two films, Tarzan the Ape Man (1932) and Tarzan and His Mate (1934). The first version of the film, directed by James McKay and scripted by Cyril Hume (Tarzan the Ape Man - 1932; Forbidden Planet - 1956) outraged concerned mothers at preview screenings so much that the MGM studio bosses demanded a reshoot. Gruesome scenes with vampire bats appeared to be the main culprit. Director McKay objected to the changes and he was replaced by Sydney-born John Farrow, who married Maureen O'Sullivan later that year (see my Terror What? page). Farrow was soon replaced by Richard Thorpe, possibly because his changes weren't drastic enough. Thorpe, an efficient and productive MGM director, pleased the MGM head office with his tamer and safer version. He would direct the rest of the MGM Tarzan films. The first two MGM Tarzan films each cost over a million dollars to make but provided generous returns for the investment. 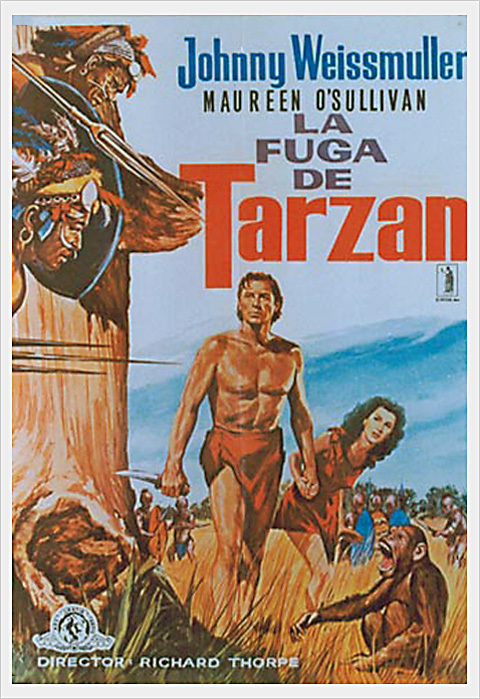 The total cost of Tarzan Escapes was about two million dollars but it failed to draw audiences, forcing MGM to question their long-term plans for the series. (Essoe, Fury & St Andrews) Read the full intriguing story at Geoff St Andrews' Tarzan Escapes page.  Jane's cousins, Eric and Rita Parker, travel to Africa to persuade her to return to England to claim a sizable inheritance. Their guide is a shady character named Captain Fry who has heard of Tarzan and plans to capture him to display as a carnival attraction wild-man in England. Jane reluctantly agrees to leave when she learns Eric and Rita have invested their life savings in their trip to collect her. Fry tricks Tarzan into believing that Jane has left him forever and Tarzan, dejected, enters Fry's cage. Jane and her cousins' safari are attacked and taken prisoner by natives who practice human sacrifice. Tarzan manages to escape his cage by calling elephants to bend the bars and he rescues Jane and her relatives. The party, including Fry, travel through a dank, boggy cave to escape but at the end of the journey Tarzan directs Fry to reenter the cave. Fry slips and falls into a swamp where he is eaten by lizards. Eric and Rita confess that Jane need only provide a signature to gain the inheritance and Tarzan is very pleased that Jane does not have to leave. Once again, Tarzan and Jane learn that they are happiest when left alone by outside intruders interested only in their own self-gain. • The two photos were donated by Geoff St Andrews. Thanks a million, Geoff!